The Western Trust has temporarily halted routine inpatient appointments being booked at Altnagelvin hospital. The move affects non-urgent procedures, but day procedures, urgent cases and cancer surgery are going ahead. Operations were affected last week due to a nursing shortage and vomiting bug. The situation at the hospital is being reviewed daily. A GP from Londonderry, Dr Simon O'Hagan, said he was "embarrassed". "Hospitals are under a lot of pressure and we are feeling the knock-on effect too. The system is broken. "God help those who are waiting for a procedure at the moment. If it's not life threatening, then you could be waiting years for treatment." He explained that the move at Altnagelvin could affect physiotherapy patients, those with hearing problems or those who need hernia or gallbladder operations. "The service is failing us as doctors, nurses and our patients," he said. "The current waiting time for hip replacements is 161 weeks until the patient will have an appointment and a further 156 weeks before the surgery happens. It is unclear when the current situation regarding the suspension of bookings began and how long it will last. 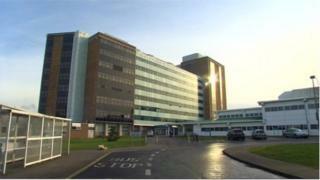 BBC Radio Foyle has been speaking to four nurses, who want to remain anonymous. One woman, who has worked in the hospital for six years, said: "We are having to turn people away and it is sad and demoralising. "We are worked to the bone and there's no sign of any relief coming our way any time soon. "I recently worked a double shift and there's no way that's good for patient care. Especially for those who are in pain every day." A trust spokesperson said: "The situation at the hospital is reviewed on a daily basis with a view to making best use of our available bed capacity, and to ensure our most clinically urgent patients receive their scheduled operations and treatments."